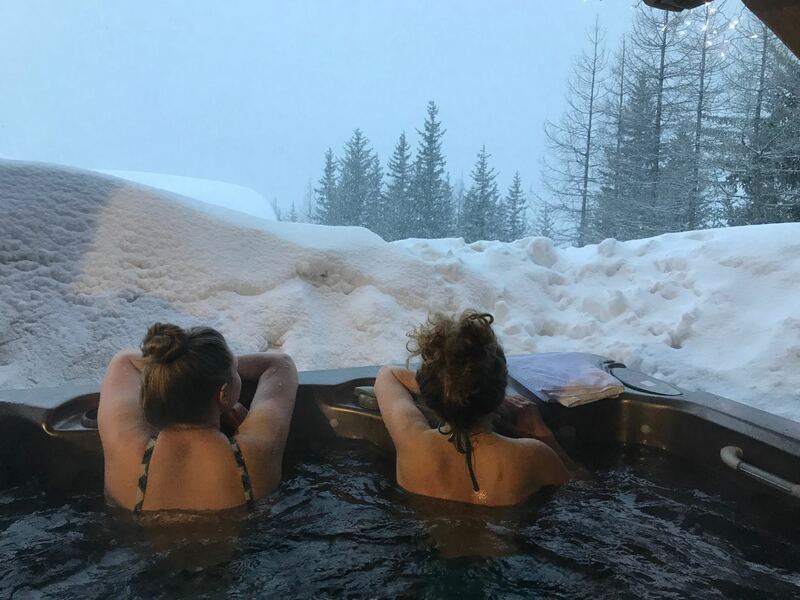 A typical day in La Rosière: Skiing into Italy for lunch, schussing down wide stretching pistes, pausing for a Vin chaud and ending the day in an outdoor jacuzzi. 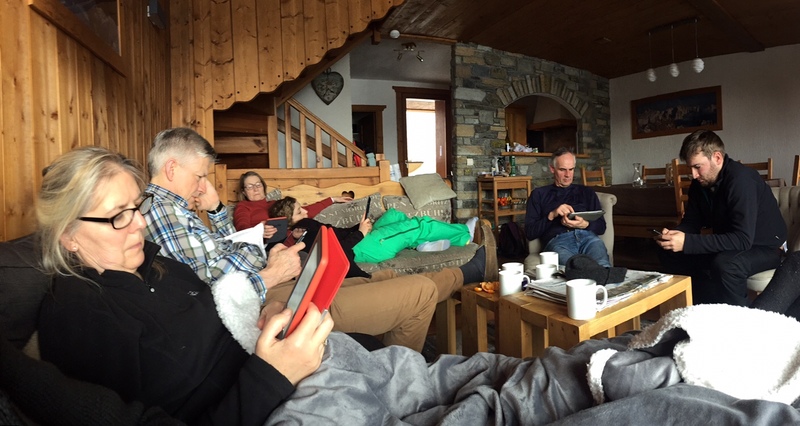 The Whitehead/Poffley clan has skied in the La Rosière area three times over the years, and all three times we stayed in Les Eucherts. 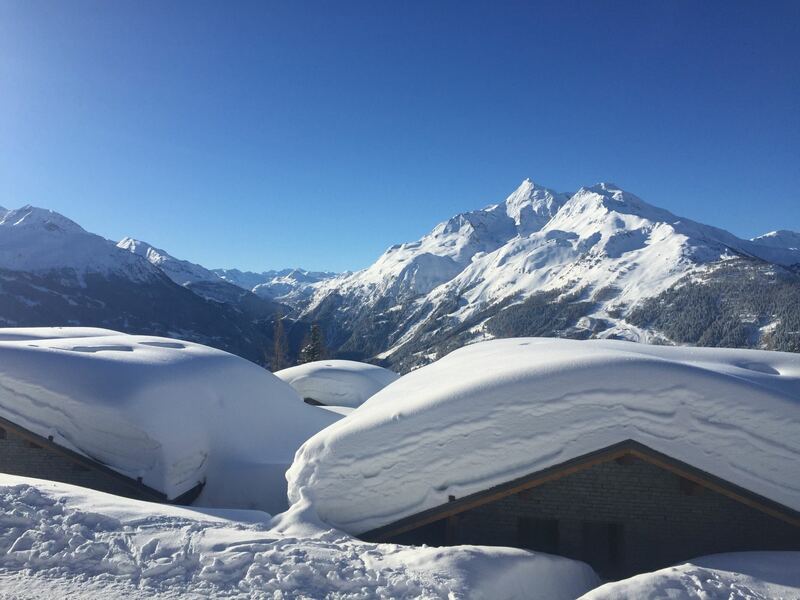 We love this ski resort because it’s high up (altitude 1860m) so you’re sure of snow, it’s not too far from nearby airports, and on a nice day you have the luxury of skiing into Italy! The beautiful view from our chalet balcony in Les Eucherts. Why Les Eucherts specifically? 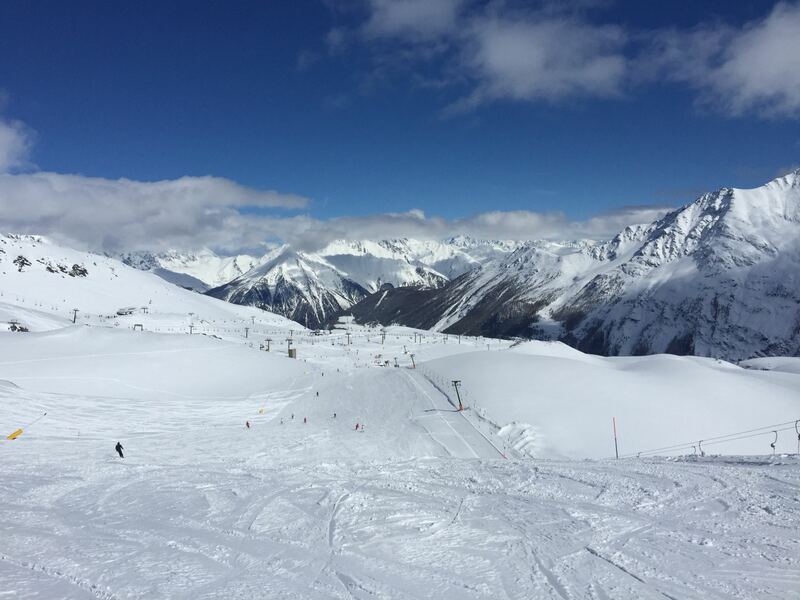 It’s quieter than La Rosière but still has everything you need – ski hire, supermarket, and crucially, a chairlift. It’s only a 10 minute walk into La Rosière through beautiful snowy woods, and you have the same beautiful view over the mountains. Chilling out after a hard day’s skiing. We’ve found the best place to stay for a group like ours is Les Balcons, which houses groups of 10 or even 12. This year we had a traditionally decorated chalet over 3 floors, with 4 bedrooms and 4 bathrooms (never skimp on bathrooms) plus a shared jacuzzi! Me and Rosie watching the snow from our outdoor jacuzzi. Whitehead booking tip: always make sure there’s a communal seating area that can comfortably seat everyone in your group. 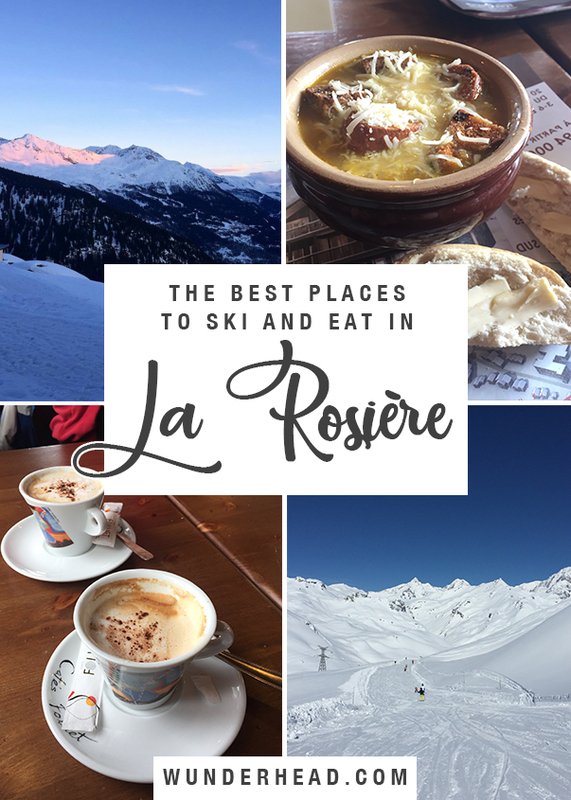 One of the best parts of a ski trip is exploring the local area, so of course if you choose to ski in La Rosière you must find your own favourites. To give you a taste, here are some of ours! 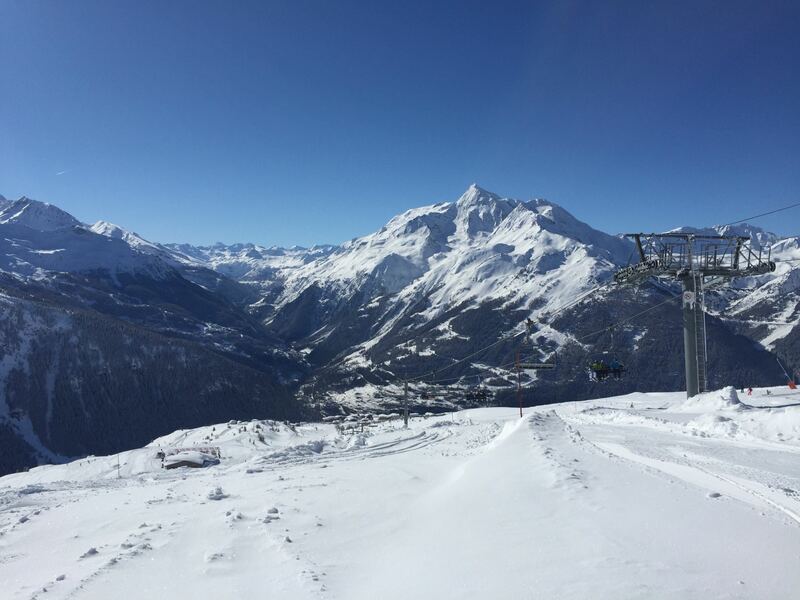 As the main peak over Les Eucherts and La Rosière, Le Roc Noir is a great place to start your day, with amazing views and the option of red or blue pistes for you to enjoy. The view towards Les Arcs from the top of Eucherts Express. 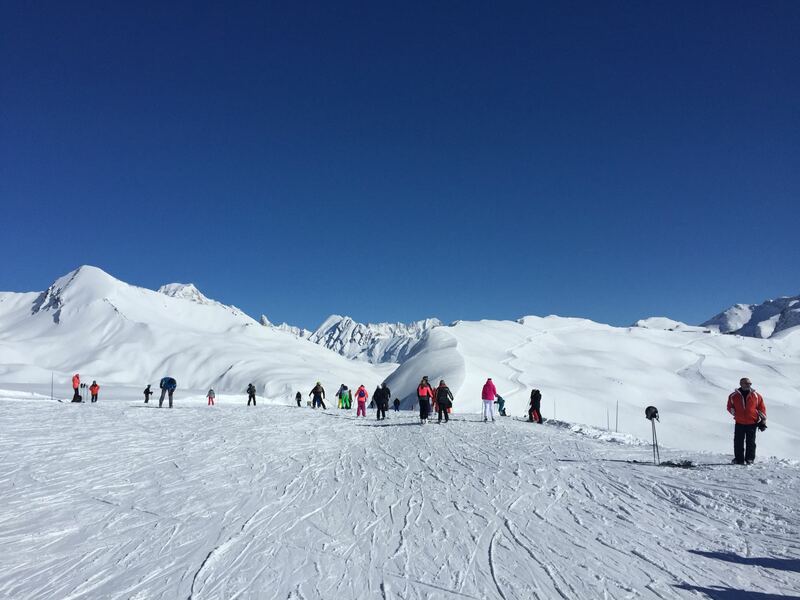 If you like a long uninterrupted ski from the highest peak to the lowest valley, follow the marmottes piste down from Le Roc Noir all the way to Le Vaz. This beautiful route has you gliding around corners, through snow laden woods and ending by a peaceful trickling stream. Posing amongst the trees on Marmottes. The Fort Express is the only way to get to Italy from La Rosière and Les Eucherts, so expect big queues on sunny days. It’s totally worth it though, with a vantage point from the peak that looks out towards Mont Blanc itself. If you can stand to queue twice, make sure you race down the Fort Bordercross before continuing on to Italy. Setting off down Belette towards Fort de la Redoute. The best way to get to La Thuile has to be the Fourclaz down from Mont Belvedere. Stop to admire the view, take some photos, then push off from the top and schuss all the way down. The view from the top of Fourclaz Express. The main peak above La Thuile in Italy, there are so many routes down Chaz Dura that you can be entertained all day. Another massive plus would be all the Italian restaurants where you can stop for lunch. Skiing down Promenade towards La Thuile. The route back from La Thuile to La Rosière features some truly spectacular views, none more so than from the top of Mont Belvedere back towards Col de la Traversette. 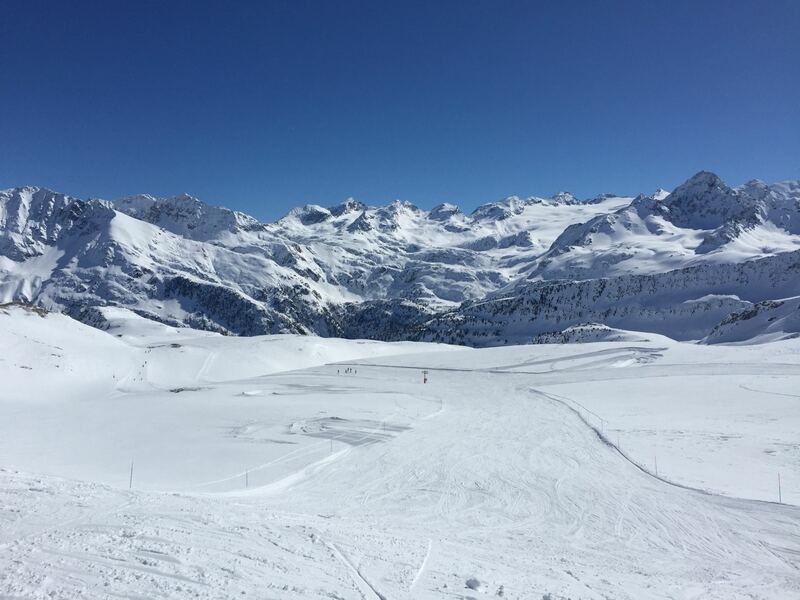 This whole section of the piste map is called Col du Petit St Bernard, and it’s one of our favourite areas to ski. Admiring the mountains from the top of Mont Belvedere. 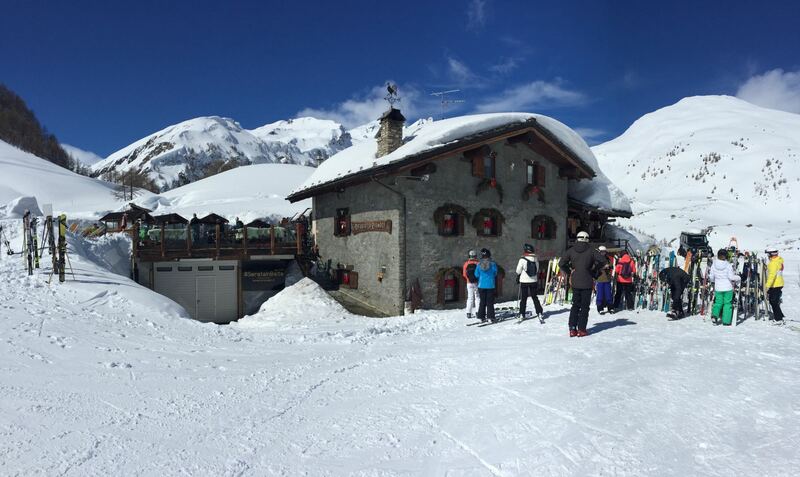 Nestled between two pistes at the bottom of the Fort Express chairlift, la Traversette is a self-service restaurant with an extensive menu. La Traversette at the bottom of the Fort Express. 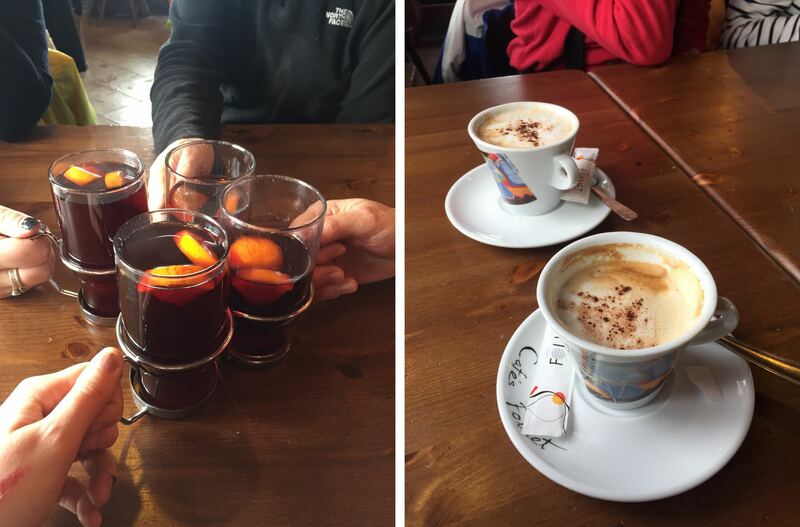 We stopped here for a Vin chaud on a blustery morning, and liked it so much we came back for lunch on two separate days. No ski morning would be complete without a hot beverage. The self-service layout works really well for a big group, and there’s something for every appetite. 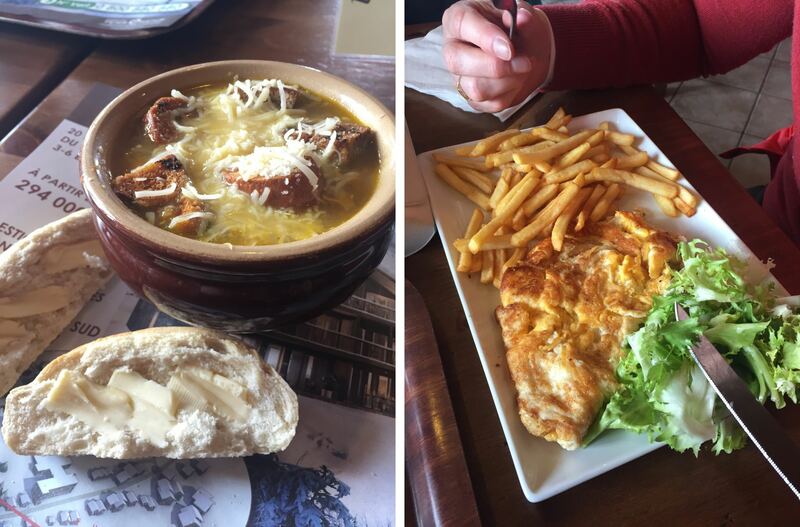 Carbs with a side of carbs – the ski diet. Technically in Italy, Lo Riondet was our favourite restaurant of the whole holiday. 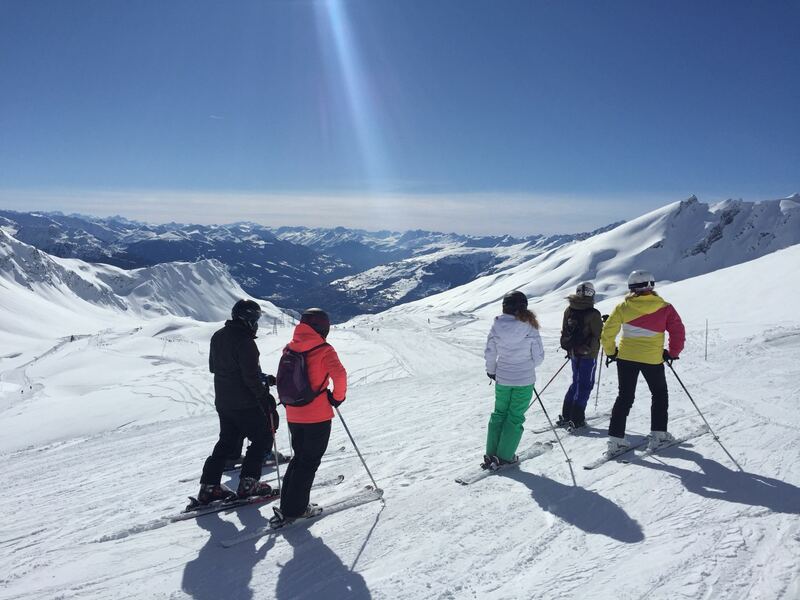 Even the ski route to get there is thoroughly enjoyable, with long sweeping slopes down through snowy valleys. Our favourite restaurant, well worth the journey. Whether you visit on a snowy or sunny day, Lo Riondet is perfect. During the snowstorm day that was our Monday, we found a cosy bar area with fur draped benches, heated with a huge fireplace in the corner of the room. Drying our gear and warming our bones by the fire. We all swooned over our freshly made Italian pasta, served on hot slate and buried in Parmesan cheese, and Dad spent the rest of the week fantasising about buying the whole restaurant to run himself. The highest praise. 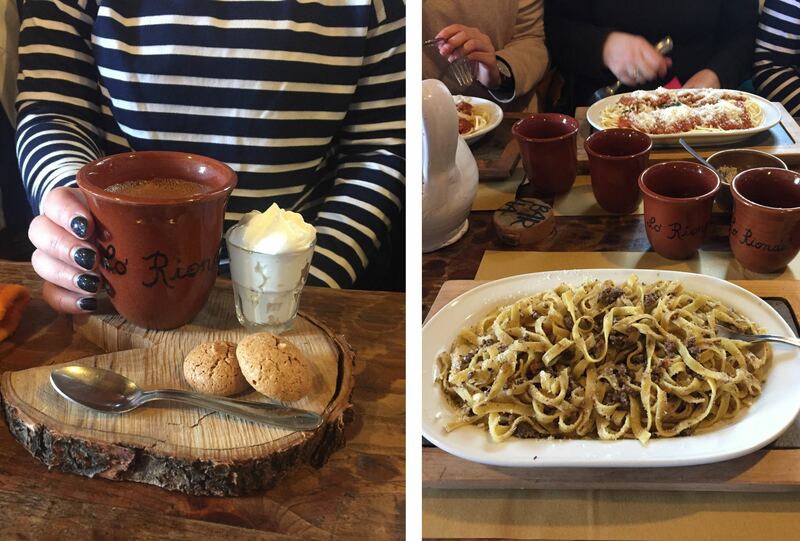 Hot chocolate with whipped cream and amaretti biscuits, and homemade Italian pasta with wild game ragu. When we returned on sunny Wednesday, the place was packed out, with diners filling the terrace tables, the sheltered balcony and both floors inside. Despite the demand, we found the food just as delicious, and the service just as attentive. We immediately booked a terrace table for Friday. Perusing the menu on the Lo Riondet terrace. A self-service restaurant right in the middle of a busy area, le Plan du Repos is always packed with people. As we tried to find a table large enough to seat all 9 of us, we stumbled across a secret lounge area on the mezzanine, complete with blankets and fluffy pillows. The cozy mezzanine in Le Plan du Repos. 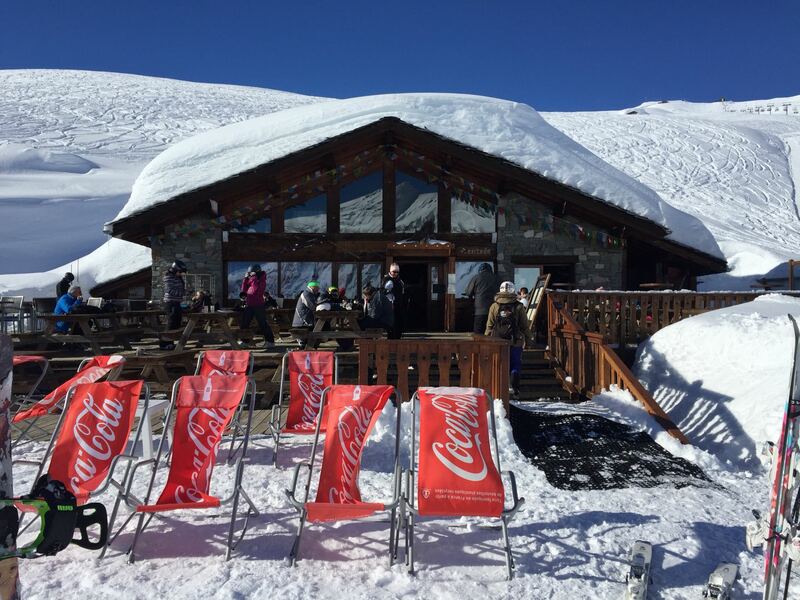 This restaurant on the side of the pistes in La Rosière is perfect for large groups. We dragged ourselves through the doors of le Relais du Petit Saint-Bernard on one of the worst snow days of our trip, and were truly grateful for the big table and the fast drink delivery. 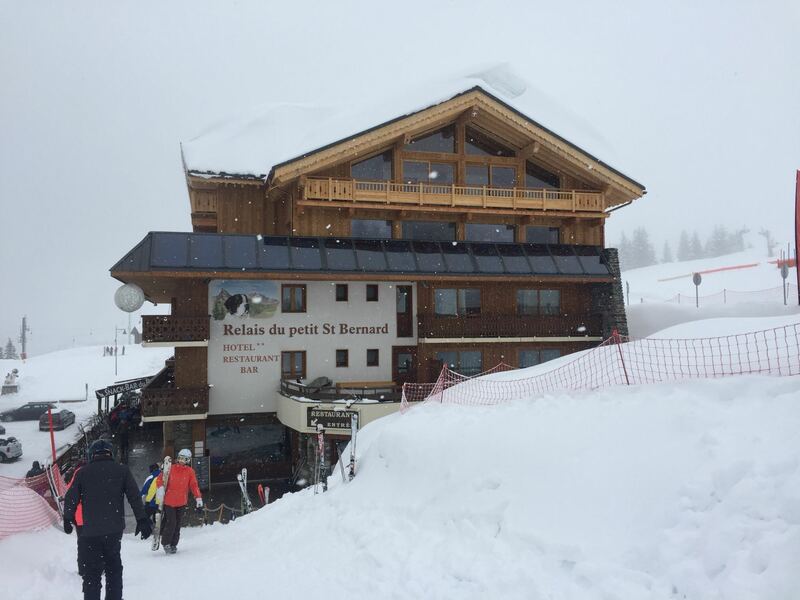 Heading to Le Relais du Petit Saint-Bernard, a warm beacon in the snow storm. 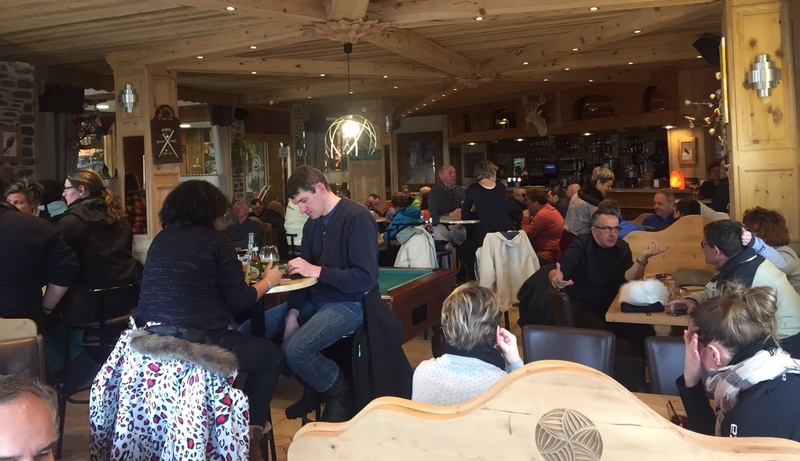 Right in the centre of La Rosière, Arpin’s Bar is a local favourite anytime of day, and a Whitehead favourite during happy hour! 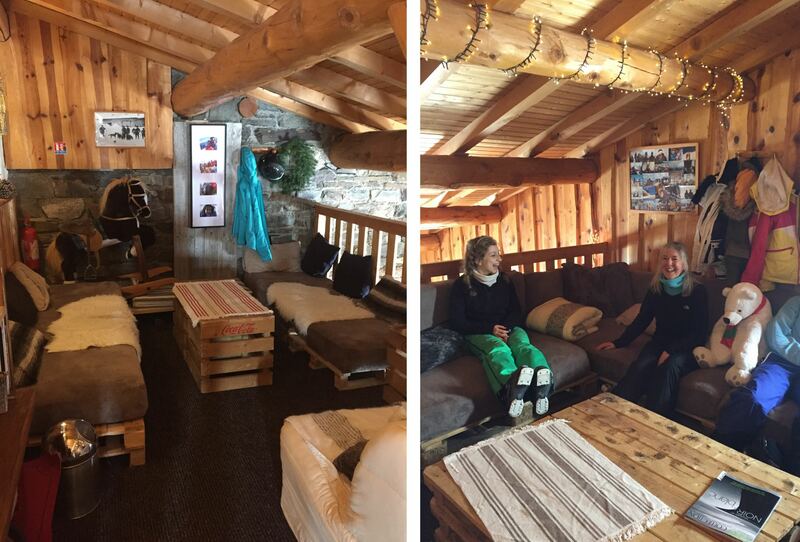 Arpin’s Bar is perfect for a coffee break or an après-ski. 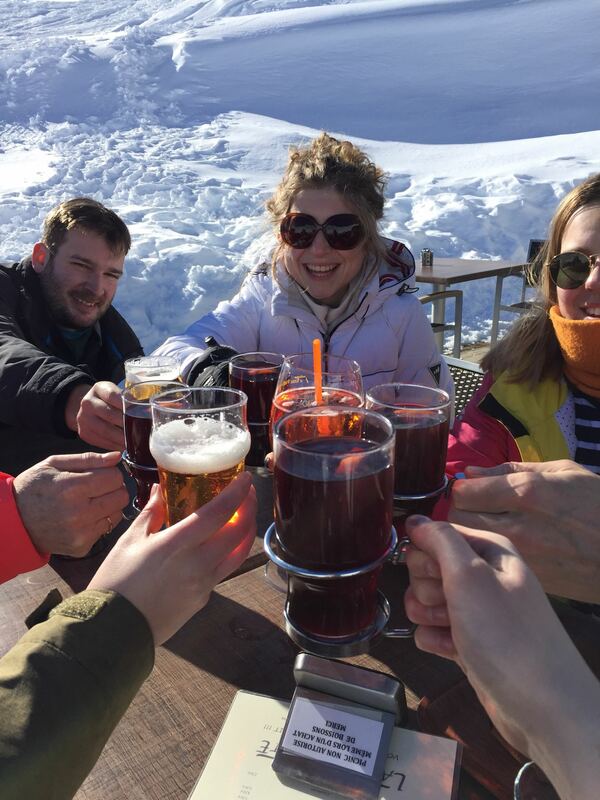 La Rosière is a fantastic ski resort for all levels of skier, with a huge variety of pistes, beautiful views and plenty of great places to stop and relax. Our après-ski in the sun: cider, vin chaud, bière blanc and Aperol spritz from La Traversette. 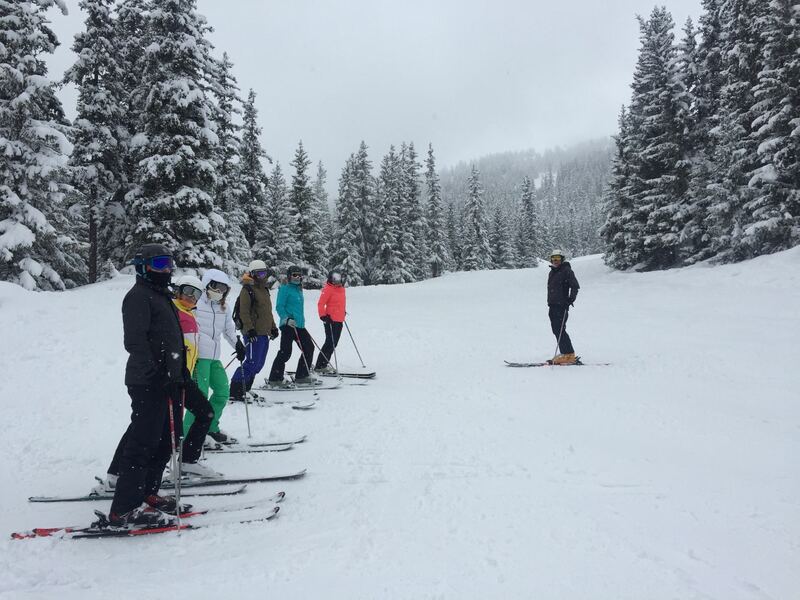 If you’re an avid skiier, check out my post 5 things you didn’t know you needed on a ski trip! Next Post Ever stayed in a leisure barn? I love La Rosiere, not been there since we nearly blew up the chalet on a ski trip 8 years ago (that’s a very long post that needs writing!). Happy days.